This diagram reflects the relationship between the components that compose the vOneCloud platform. vOneCloud is an appliance that is executed on vCenter. vOneCloud then leverages this previously set up infrastructure composed of vCenter and ESX nodes. 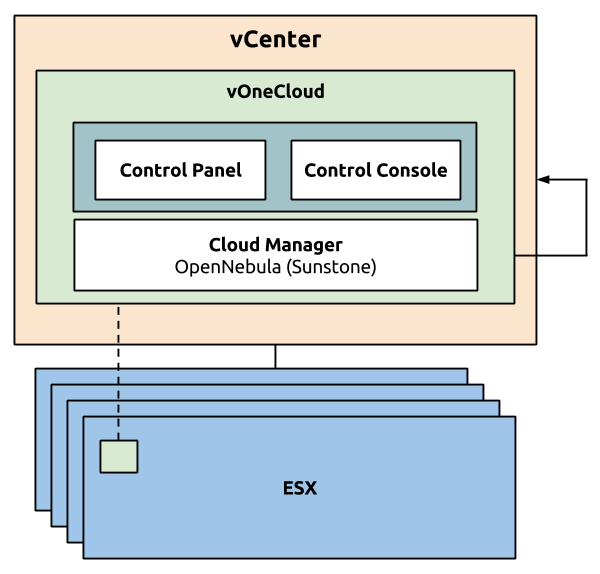 OpenNebula acts as the Cloud Manager of vOneCloud, responsible for managing your virtual vCenter resources and adding a Cloud layer on top of it. Sunstone is the web-based graphical interface of OpenNebula. It is available at http://<appliance_ip> . This interface is at the same time the main administration interface for you cloud infrastructure, and consumer interface for the final users of the cloud. Control Console and Control Panel are two components which have the goal of configuring different aspects of the vOneCloud appliance: network, appliance user accounts, OpenNebula (Sunstone) configuration and services. The Control Panel is a slick web interface and is oriented to the configuration of the vOneCloud services as well as used to update to a newer version of vOneCloud.